Taylored Expressions June Sneak Peeks: You're Sweet! Hello! It's Day 2 of sneak peeks from Taylored Expressions, and all of the new products will be available on Thursday, June 8th at 7AM PDT! 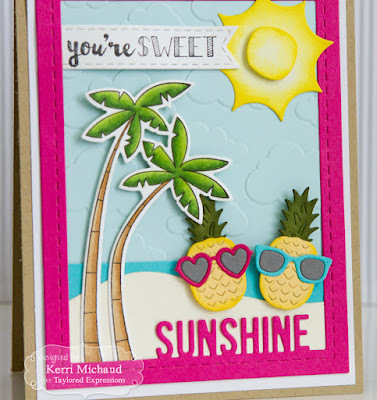 For my first peek today, I used the adorable new Little Bits Pineapple Die along with the fun new Little Bits Sunglasses Die! I put my pineapples together using Potato Chip and Sweet Basil cs and sponged around with the same colors of ink. The sunglasses were cut out of Cookie Monster, Lollipop, and Earl Grey Ink. I started by cutting a piece of Lemon Meringue cs using the Sunshine Cutting Plate, and then sponged around the center using Candy Corn Ink. I then added the waves cut with a Build a Scene Rolling Waves Die out of Cookie Monster cs and sponged with Cookie Monster Ink. 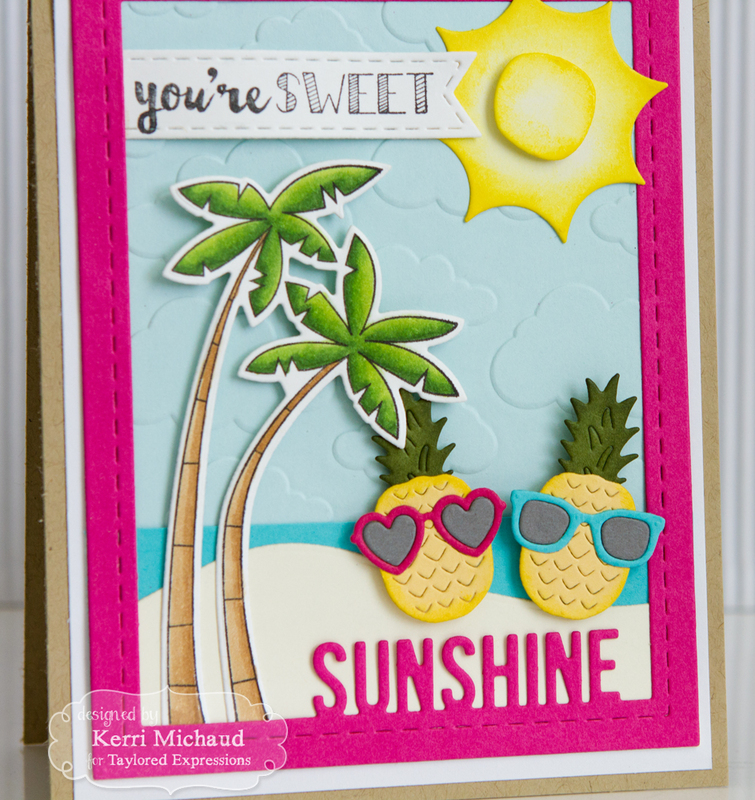 The sand was cut using a Build a Scene Rolling Hills Die once again along with some Buttercream Frosting cs. 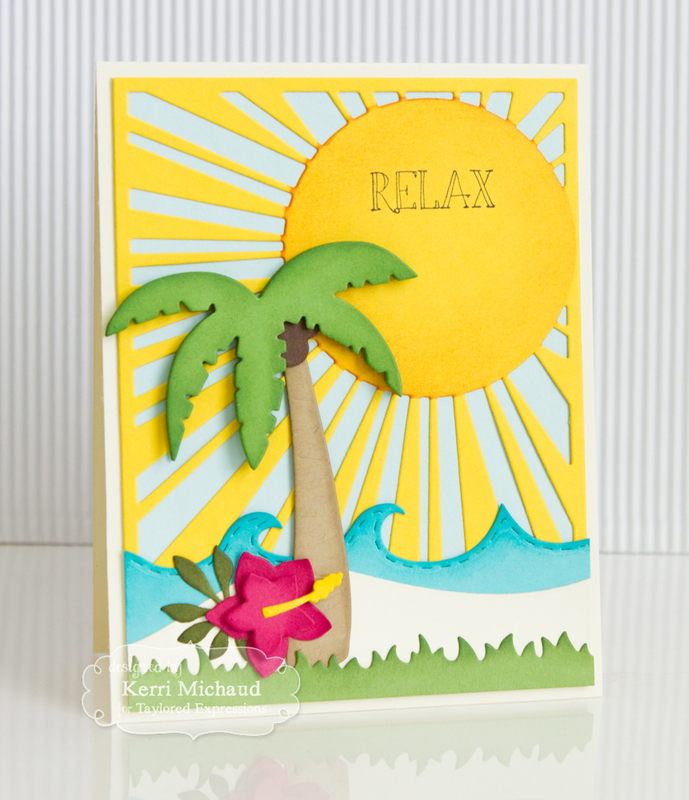 I then added the grass cut out of Peapod cs with the Grass Border Die. The awesome palm tree and hibiscus flower were cut using the new Build a Scene Tropical Dies. I am loving this new set of dies!!! I cut the base of the tree out of Toffee cs and the top using Peapod cs. The coconuts were cut out of Chocolate Truffle cs. 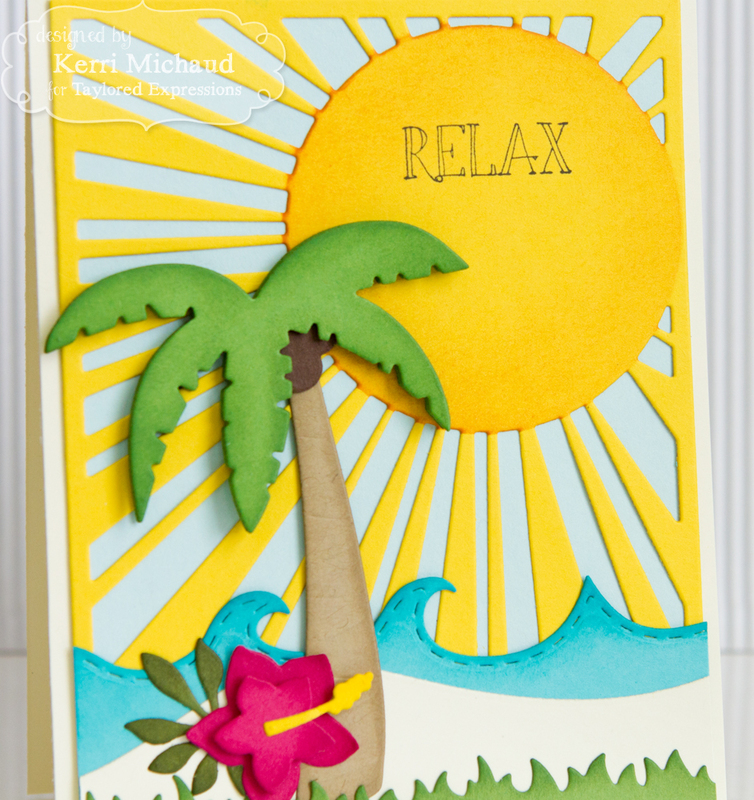 I used two of the flower dies to make my hibiscus and cut them out of Lollipop cs. The center was cut out of Lemon Meringue cs, and the leaves out of Sweet Basil cs. To finish off my card I added the sentiment from the Big Kahuna Stamp Set. Doesn't it make you want to go lay on the beach? 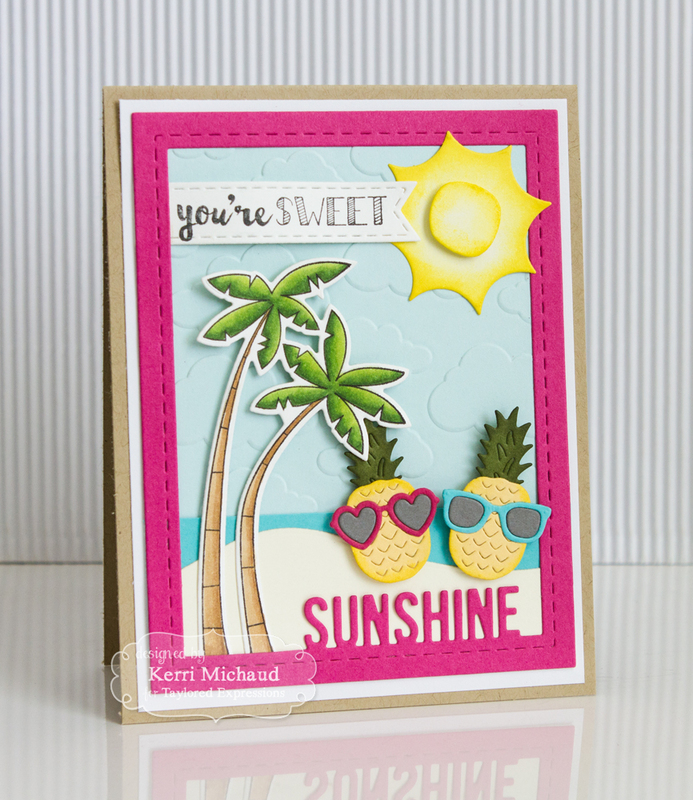 For a limited time, earn DOUBLE CRAFTY POINTS on our Sunshine Cutting Plate! If you're not a Crafty Points member, it's free and easy to join. Just create an account at the TE webstore and you're automatically enrolled to begin earning crafty points with every purchase. You'll earn 48 Crafty Points on the purchase of our Sunshine Cutting Plate! Offer valid on qualifying purchases made between 9am CST on Thursday, June 8, 2017 and 11:59 pm CST on Sunday, June 11, 2017 and only while supplies last. 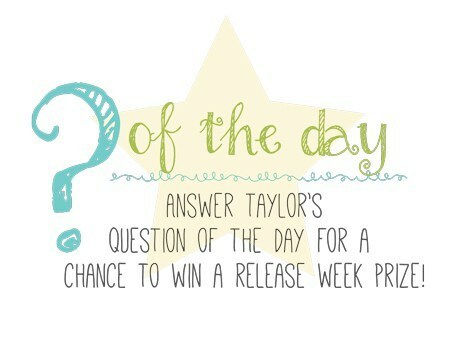 Crafty Points are only available on purchases made via our retail site: www.tayloredexpressions.com. Thanks for stopping by! If you'd like to see more projects and new product information, please head over to the TE Blog for a complete list of our participating designers! I'll be back tomorrow for more peeks!